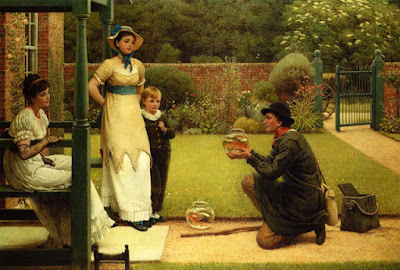 The Kissed Mouth: Go Fish! 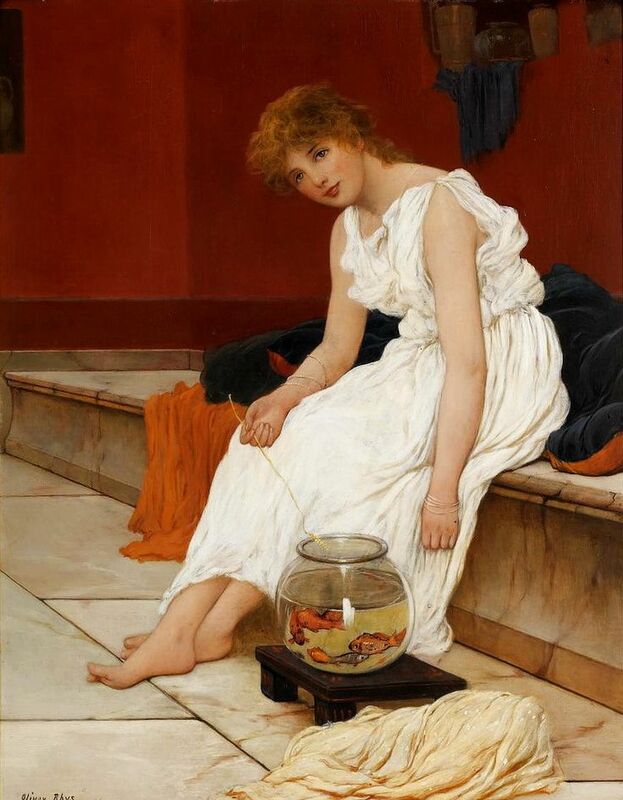 Obviously in Classical Times it was popular to go to the Classical Fair and win a Classical Goldfish. Forgive me for saying so but there are levels of oddness going on in that household that I don't quite understand. Firstly, who made that fish bowl stand? It must be the most rubbish one I have ever seen as what is the point? That's too low to be of any help with anything. I bet someone's child made that in woodwork class and now the parent feel obliged to use it. 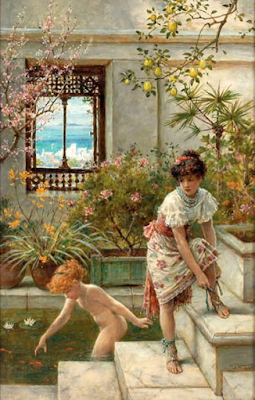 Also why is our Classical Maiden poking her fish with a stick? That family needs sorting out. 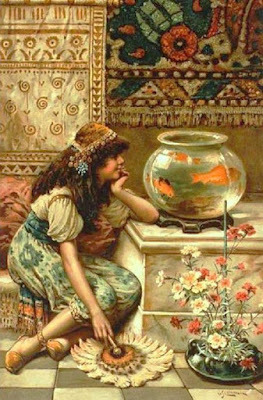 Goldfish obviously meant 'exotically ancient' to William Stephen Coleman and little girls and goldfish went together like bread and butter. Maybe it was the brief life of the fish (especially if you let your tweenager wade about in the pond) that echoed the briefness of childhood innocence, or the fragile beauty of them both, or possibly their ability to forget the thing you told them ten seconds ago (she says, from experience). Whatever the case, his pictures are clear, bright and very, very commercial. This is one of my favourite goldfish related pictures as Leslie does such charming scenes without them being too overly Millais-sickly. His picture is a rarity as it has an actual man present! Why goldfish were particularly a woman/child thing is unclear: Are women beautiful? Useless? Confined to a very small bowl? Anyway, I never really thought how the goldfish got into the Victorian home, but according to this image, a nice looking man came round with a bag full of glass bowls. The logistics of this seem a little fuzzy, so we'll just draw a veil. 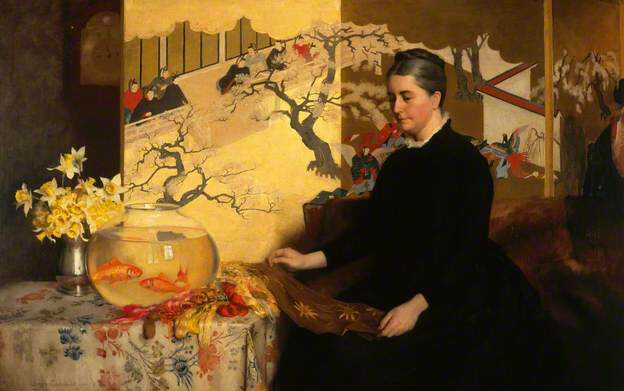 The depiction of goldfish in the Victorian domestic interior seems to have been a mark of the fashionable and aesthetic. For all intents and purposes, Milton shows us a standard Victorian home but in the middle is a massive trifle bowl filled with fish, and a gauzy woman. They seems to have been transported from another picture, presumably one with lots of tiles and a fan made of ostrich feathers. However, here we are in a mid-century French home with a naughty French lady and her bottom. 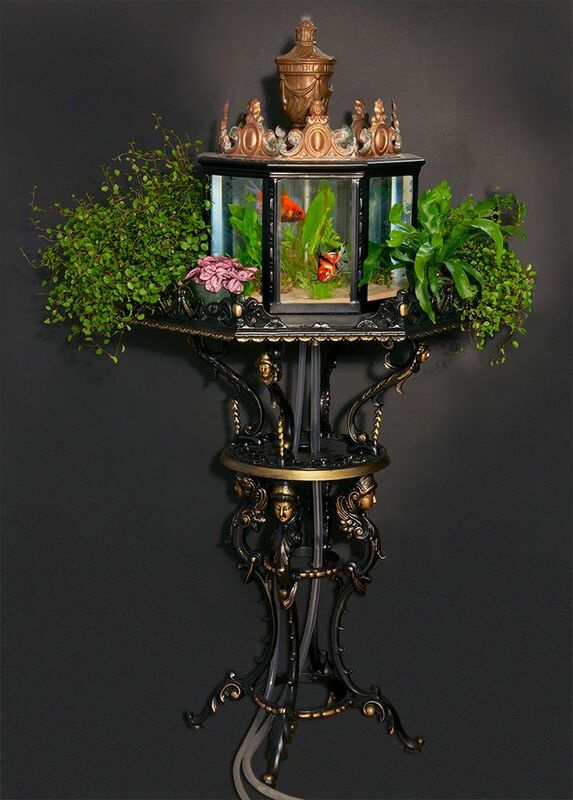 I'm going to guess that she is someone's mistress and her purpose is merely decorative, like the fish. Unless it is a French custom to feed your fish wrapped in a bit of muslin? 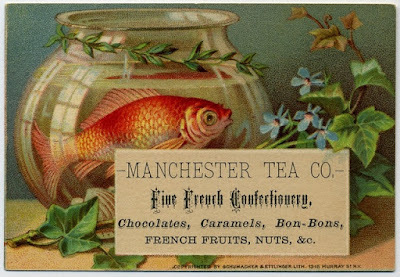 Having the fish might have been an extension to the fashion for all things Chinese and Japanese (and everybody-wash-your-knees, as they say in the film Topsy Turvy). 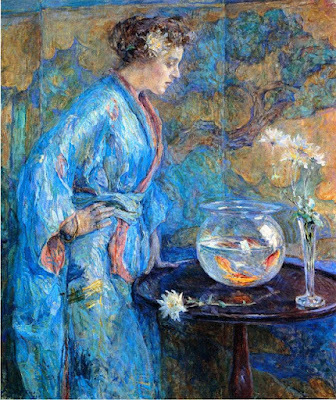 This young Edwardian lady tends her fish in front of her Japanese screen, wearing her Kimono. I could easily launch into a discussion here about cultural appropriation (as I did in this post) but we won't get into that now. I do however find that sort of cultural 'loading' in a picture a bit odd, as I do in real life. Does the woman feel very 'Japanese' by wearing her kimono in front of her screen while tending her goldfish and chrysanthemums? I enjoy a baguette as much as the next person but I've never imagined myself French, nor worn a beret while eating it. 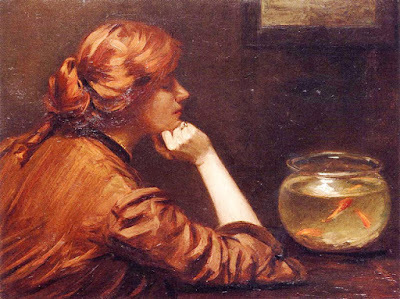 The bulk of the images I found concerned women gazing into their goldfish bowls deep in thought (which in itself is an irony, if you consider the most common belief of goldfish). Perugini's lady is wandering about with her bowl which seems an awful effort considering it is rather heavy, liable to spill and surely she has servants for that sort of thing? She has the sleeves of a woman who has servants. 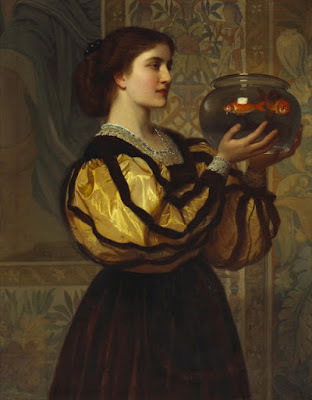 Here we have another woman carrying her goldfish about. I am intriged by her belt and what that has to say about her. 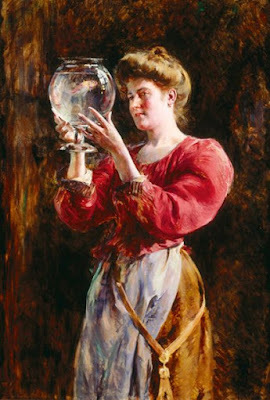 She does appear to be wearing an apron so maybe she's a servant but the title is lady with a goldfish bowl, rather than 'woman'. The most sensible way to enjoy your fish is to sit down and stare at them. 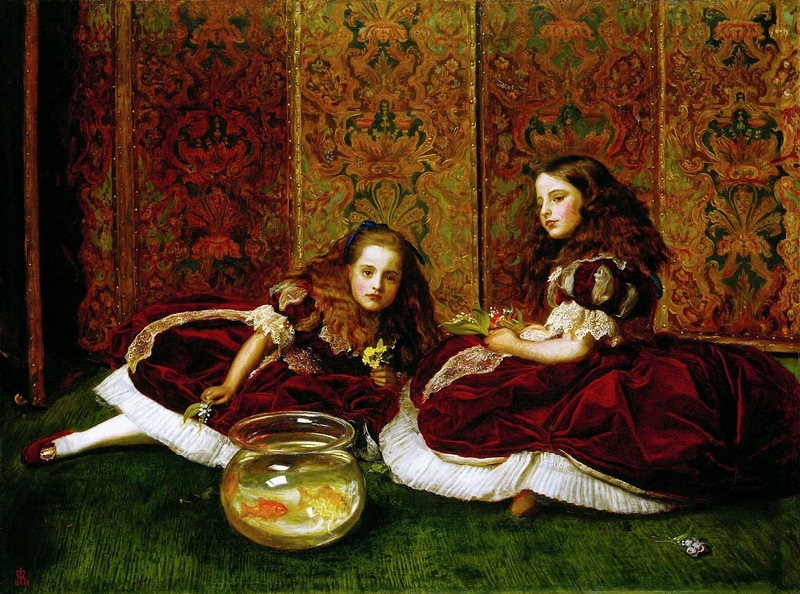 Firstly, the fish would appreciate the lack of danger of being smashed, sloshed out or generally swished around, and the artist can make everyone look peaceful and contemplative. 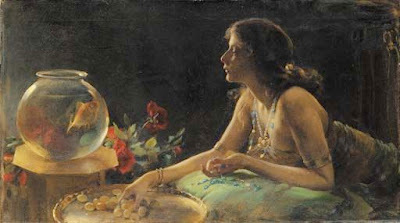 Unlike White's rather dull brown home and owner above, Curran shows a far more glamorous girl, admiring her glittery fish as she eats grapes. Although White uses the word 'idle' in his title, it seems far more suitable for Curran's home of riches, where you get a big soft pillow and some nibbles. Lovely. We return, in conclusion, to nakedness. 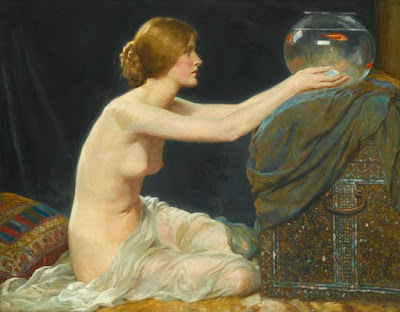 Although a very beautiful picture, I can't think that placing your bowl on top of the round-lidded chest, on top of a slippery scarf is the most sensible move, especially when you are mostly naked. Despite ringing a number of Health and Safety bells, the contrast of the midnight blue, the alabaster skin and the tiny orange fish is exquisite. the length of her limbs, holding the shining globe seems to foreshadow Art Deco in a subtle way, and I love how her hair is echoed in the golden tiles of the chest and the embroidery on the pillow. Heavenly. I have lots and lots more goldfish ladies and so I'll post them on my Facebook page. 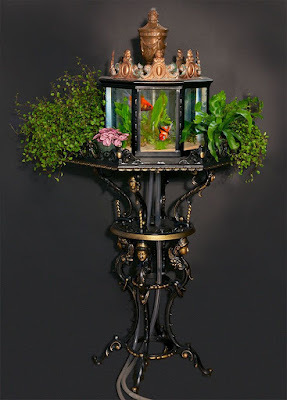 If you are over on Facebook, feel free to join me on my author page where I post lots of Victorian silliness for your amusement. See you there! The fish shop sign seems to have been fixed. 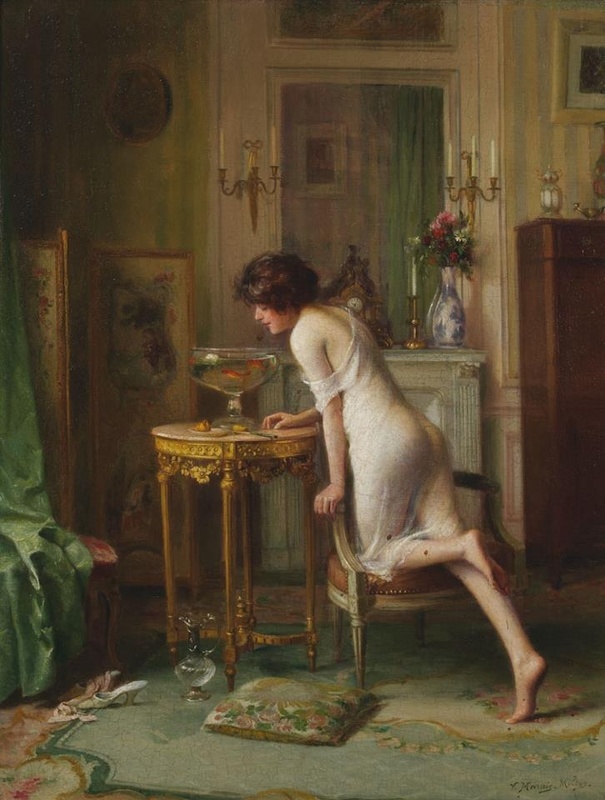 I think the young French lady in the Victor Marais Milton painting has accidently spilled the goldfish bowl over her nightie and has hurriedly refilled it with fresh water. She hasn't had time to change into dry clothes as yet.